Pipsqueak Theater "Sing With SANTA"
Pipsqueak Theater is back for a 7th Season performing their Christmas Holiday Show “Singing With SANTA” on stage at the 20th Century Theater. Meet Santa, Mrs. Claus and some of Santa’s favorite Elves as they really get to work preparing for Christmas…Want to get a “sneak peak” into how the Naughty & Nice book operates…? 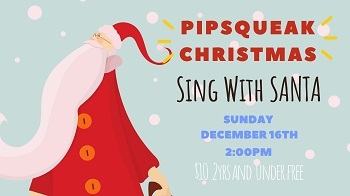 Only at Pipsqueak Theater, December 16th, 2:00pm tickets $10, 2yrs and under free. After The Show, It’s all about fun in Santa’s work shoppe…so, grab your friends and family and head over to the mail room and write your letter to SANTA at the letter writing work shoppe. Next, it’s over to the the Feed Store to learn how to create Magical Reindeer Feed that will help the flyers locate your house. Then, it’s all about crafts and ornaments for your tree. While you wait to visit with Santa; decorate your own famous Pipsqueak GIANT Cookie and chat with your favorite Elves!